Over the course of the last weekend of September, I attended the Pat Rodgers Memorial Revolver Round Up hosted by Hardwired Tactical Shooting in Carrollton, Texas. The 2018 course focused on snub nosed revolvers and I contacted several companies for products designed with the Ruger LCR in mind for test and evaluation. HolsterOps responded to my request for a Rogers Enhanced LCR Grip and quickly shipped one for review! In addition to the two days of coursework, I was also able to run these grips in a local match. At the beginning of December, one of the local clubs hosted an IDPA BUG (Back Up Gun) Match. This division is restricted to five shot revolvers that are under 22 ounces, and fit into the test box (6 1/2'' X 4 5/8'' X 1 3/8''). Unfortunately, these grips are a bit too large for the box. For range use and concealed carry, these grips are awesome! The Rogers Enhanced Ruger LCR Grip was designed to improve on the factory issued model. HolsterOps opted for a material change and constructed the grips out of hard plastic rather than softer rubber. Fabric often clings to rubber, which can be bad for concealed carry as it can reveal the firearm. The smooth material prevents any snags, but the side panels are textured to reduce the revolver from shift in hand under recoil. Aside from the material change, the most noticeable difference is in length. The dimensions are only slightly larger than the original grips, but do allow for the full grip. Palm swells are also present to fill the hand and provide a more complete grasp of the grips. 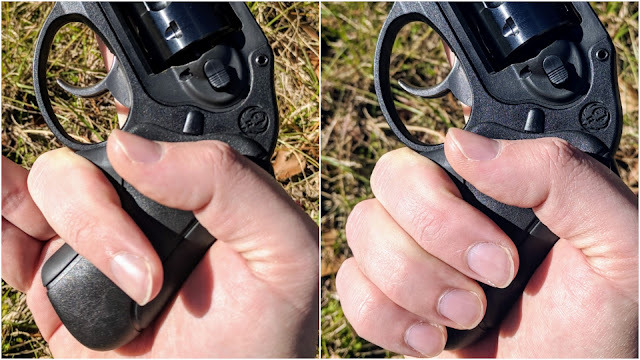 Enlarging the stocks on a revolver can lead to concealment issues; however, in my experience, the size does not make the LCR any less concealable than the the standard rubber grips. The Ruger LCR ships from the factory with Hogue Tamer grips. Tamers feature a squishy recoil pad positioned under the web of the shooting hand to soften recoil. 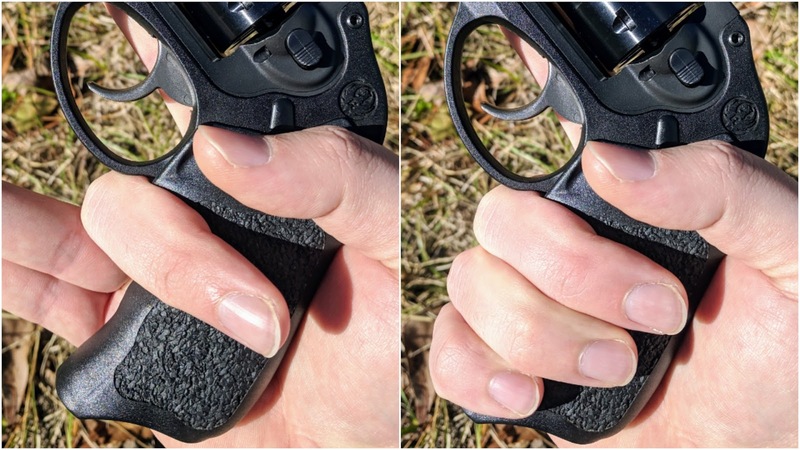 Shooters with averaged sized hands can squeeze two fingers on these rubber grips. Out of the box these are very comfortable, but I don't particularly like finger grooves. I'm not super fond of the factory LCR grips because of the finger grooves, so I purchased a second set for the Ruger LCR. The Hogue Tamer Bantam Boot grips don't have the grooves and are very concealable. The only negative is allow a one and three quarter finger grip...if you have normal sized hands. Folks with larger hands might only get a finger and a half. On the plus side, I think the boot grips would be great on the Ruger LCR .22LR/.22WMR models. Compared to both the factory and Hogue Bantam grips, the Rogers grips allow for a full three finger grip. A larger gripping area allows most shooters to fire faster and more accurately. The side panel texturing and palm swell also provide more contact with the stock, providing a more stable grip. 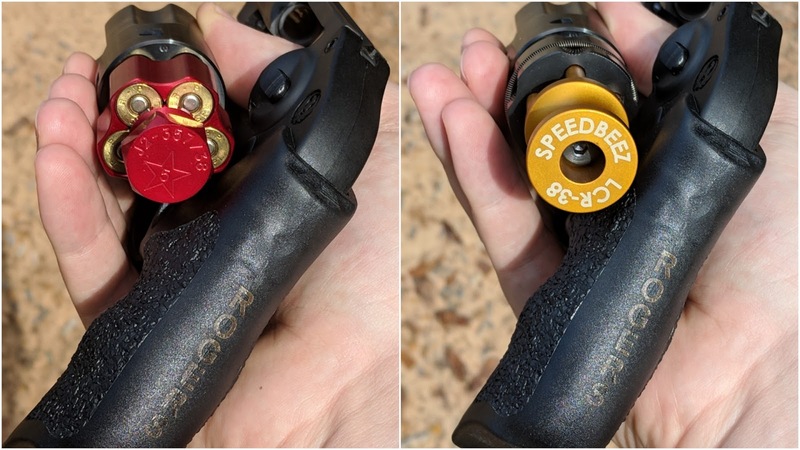 I'll be honest, when I first popped the Rogers Enhanced Ruger LCR Grips out of the box, I was worried they would be very uncomfortable to shoot. The hard material seemed like it would beat up my hands. After two days of coursework and an IDPA match, I can say that this is not the case with .38 Special ammunition. While .38 Special + P ammo is also controllable with a bit more effort, I'm not willing to fire .357 Magnum out of a 17 ounce revolver. 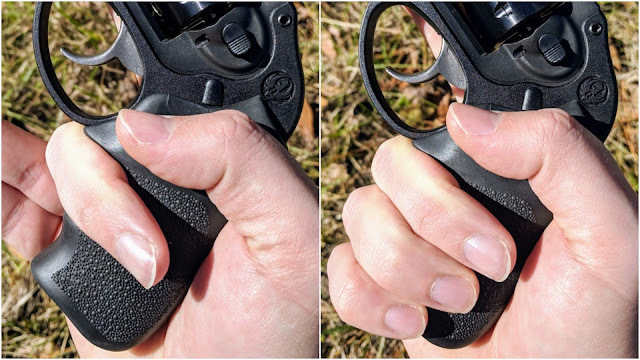 The slight palm swell of the grip fills your hand so recoil translates a bit differently. The added length also allows the third finger to rest on the grips and assist in recoil mitigation. The texture on the side provides additional control without being to rough. In my opinion, the features of the Rogers Enhanced positively improve the shooting experience of the Ruger LCR! Unlike automatics, revolvers have the ability to accept different grip shapes. Not all grips are relieved to fit different loading devices. In the previous two posts, two different LCR speed loaders have been showcased: the 5Star Firearms J2-357/38 and the Speed Beez LCR38-05. Thankfully, the Rogers grips are recessed to allow both loaders function without issue! The Rogers Enhanced LCR Grip is a great upgrade for the Ruger LCR. The slightly increased size over the factory option allows for better control without influencing concealability of the revolver. These are now my preferred grips for the LCR and I don't plan on changing any time soon. I'm glad the match director let me shoot the IDPA BUG match with my these grips, even if they don't quite fit in the box. I guess I'll have to return to the stock grips for future matches, but we'll see. I am sad to report that the grips are currently unavailable. The direct link to the product page is missing from the website as of this post. If enough people show interest, maybe the company will produce them again. 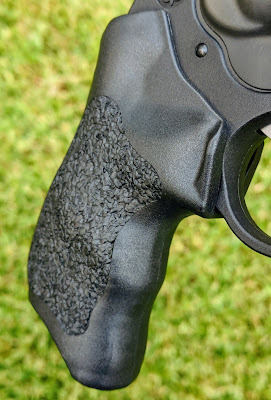 Please visit the HolsterOps website for their other great products and to one of these grips when they are in stock! I really cannot thank you enough for sharing.